The Kenora Central Ambulance and Fire Communications Centre provides call reception and dispatching services to 14 area Land Ambulance Services and 13 Medical First Response Teams. We are committed to meet and exceed the provincial mandated response time standard - reception of ambulance service requests and assignment of appropriate response(s) within 2 minutes, 80% of the time. If calls are received for remote locations or require Advanced Care Paramedics, we request ORNGE Air Ambulance. 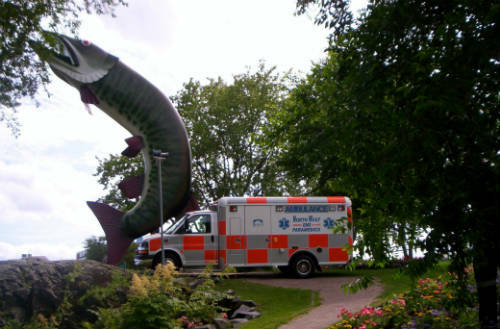 Northwest EMS is responsible for providing emergency pre hospital care in the District of Kenora, which covers a geographical area of approximately 110,000 sq. kilometers. They currently have 9 stations and 114 Primary Care Paramedics. Their bases are located in Kenora, Dryden, Red Lake, Ear Falls, Sioux Lookout, Ignace, Pickle Lake, Nestor Falls, and Sioux Narrows. Naotkamegwanning (Whitefish Bay) EMS is located south of Sioux Narrows. They have one base that is responsible for providing emergency pre hospital care in the Naotkamegwanning First Nations. They also help proved coverage for the Sioux Narrows and Nestor Falls area. Rainy River District EMS is responsible for providing emergency pre hospital care in the Rainy River District, which covers a geographical area of approximately 15,472 sq. kilometers. They currently has a fleet of twelve (12) vehicles distributed between four (4) stations in the District of Rainy River. Their four stations are located in Atikokan, Fort Frances, Emo and Rainy River.